This 20 track CD is a compilation of Fraser's last five solo albums and also includes some live tracks. With a running time of nearly 80 minutes, the two decade snapshot sees Fraser playing with some of the best in the business - Maartin Allcock, Ian Bolens, Fairport Convention and many others - and Fraser recalls: "The biggest musical thrill of my career to date was hearing Fairport playing one of my tunes - a stellar rendition of Retreat from Santa Ponsa - and it features towards the end of this album". If you've ever seen Fraser on stage you'll have heard some of these songs. 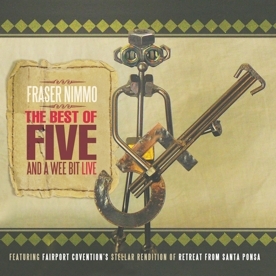 Best of Five and a Wee Bit Live is available from Fraser Nimmo's shop. "Superb value for money and I guarantee you won't be disappointed, so lock the door, grab a 'dram and mellow to the very best of the man who says he will "Sing Until He Dies" what a way to go." - Duncan Stewart, The Living Tradition.